This Liverpool fan responded brilliantly to some attempted trolling by a Manchester City supporter talking up the qualities of their goalkeeper Ederson. The City no.1 is undoubtedly a superb talent with the ball at his feet, and is well known for joining in the play sometimes by coming out of his penalty area and attempting some passes. This has prompted Twitter user ‘AJS’ to tweet that he thinks the Brazil international could do a decent job in Liverpool’s midfield – a bit of a dig at their options in that position as well as a boast about the ‘keeper’s ability on the ball. 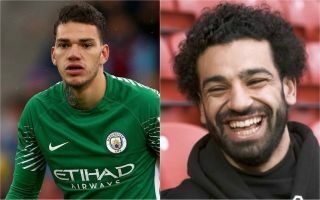 Still, this only invited an even better jibe back as Liverpool fan ‘LF’ reminded AJS of the time Ederson got caught out venturing out of his area and passing the ball straight to Mohamed Salah, who lobbed him and scored.